A new Trump campaign ad on Facebook targets seniors with a blatantly false promise. The ad, which launched on Tuesday, focuses on a quote from Trump. "If Mexico doesn't immediately stop ALL illegal immigration coming into the United States through our Southern Border, I will be CLOSING the border, or large sections of the border, next week." The ad uses Trump's promise to close the border next week to convince people to donate. There is a major problem with the appeal, however. Trump delivered the promise in a series of tweets on March 29, more than two weeks ago. Since that time, Mexico has not stopped "all illegal immigration" and Trump has not closed the border. In other words, Trump is fundraising off of a promise that he has already broken. While Trump is telling potential donors that he might close the border "next week," he has publicly stated he will not close the border for the next year. "We're going to give them a one-year warning, and if the drugs don't stop or (are) largely stopped, we're going to put tariffs on Mexico and products, in particular, the cars ... and if that doesn't stop the drugs, we close the border," Trump said on April 4. He added that, even after the year expires, he would likely impose a tariff on cars rather than close the border. "I don't think we'll ever have to close the border because the penalty of tariffs on cars coming into the United States from Mexico, at 25%, will be massive," Trump said. 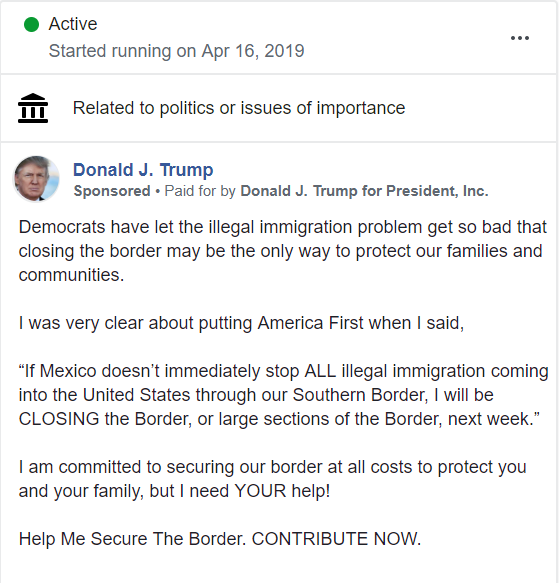 Multiple versions of Trump's deceptive border advertisement are being targeted at seniors on Facebook. This is part of a broader strategy to focus on older people online. 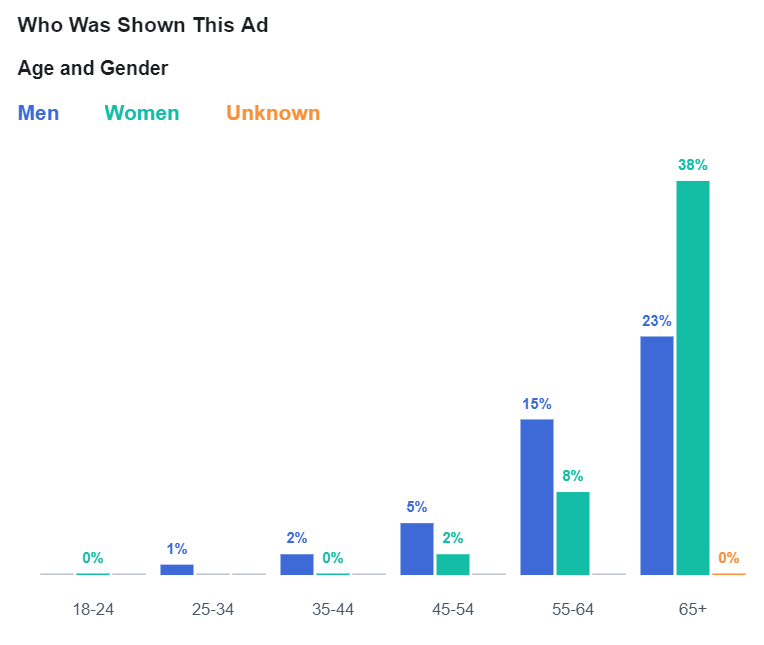 The "Trump campaign is spending nearly half (44%) of its Facebook ad budget to target users who are over 65 years old," according to a report on Axios based on data from Bully Pulpit Interactive. Older voters are a key target for Trump because they abandoned Republicans in droves in the 2018 midterms. Trump won older voters by about 10 points in the 2016 election. In 2018, voters over 65 supported Republicans by just a two-point margin. The Trump campaign is using Facebook to systematically manipulate voters based on false and misleading messages. Last week, Popular Information exposed how the Trump campaign is associating testimonials with multiple fake personas to exploit Facebook's microtargeting ability. While we know about this activity because Facebook has made political ads publicly available, the company does not appear to be doing anything to prevent deceptive ads from appearing in the first place. This is a special report from the Popular Information newsletter. You can sign up at popular.info.